There are times when you see some furniture or decorating projects which you think would suit your house but could never replicate. This could be because you think you don’t have the money, skills or resources to put such projects into practice. The thing is, sometimes looks can are deceiving, and a lot of those incredibly fancy- and impressive-looking projects are actually quite a lot easier than you thought to bring to life. In this article you will see a lot of different and stunning furniture makeover ideas that may look super impressive and stylish but are definitely doable for most people. Let’s take a look at them. 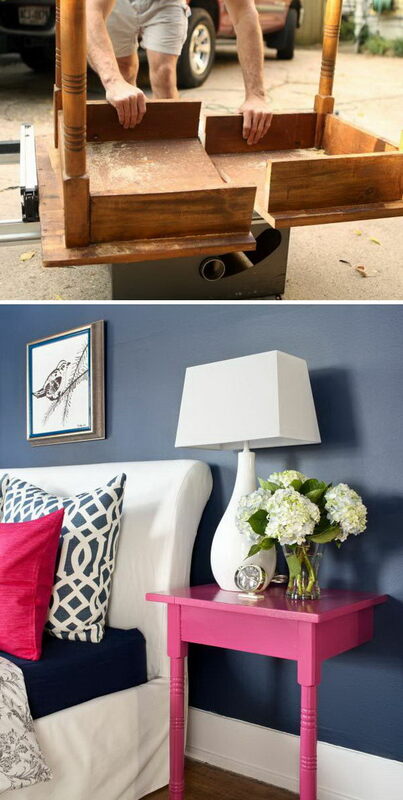 This is what you could do when you have a beautiful, wooden coffee table but need a mudroom bench instead. The table was cut in half to make the long bench, then painted white to match the room. A soft cushioned top was added as a finishing touch before both halves were installed against the wall, under the coat hangers. via 320sycamoreblog. Unused coffee tables can be very versatile pieces if repurposed. This long one was polished and painted, then fitted with a patterned, cushioned top in order to become a great ottoman seat. via sabbyinsuburbia. The boring, old cabinet storage was completely converted into a modern-rustic storage unit. The base unit was repainted and most of the drawers were replaced by open storage with fun and trendy wicker baskets. Several decorations and a dark, wooden storage board were added on top to complete the makeover. via alovelyplacetoland. You don’t need to buy a fancy, convertible crib when the regular, old ones have all the pieces you need to make your toddler a very nice and functional loft bed. All you need is your crib, some wood-working skills and creative mind. via adrielbooker. This dark wood TV stand was great, but also old-fashioned. To give it an update, these crafty owners took out most drawers and painted it white, giving it a lighter look. The bottom was also carved into a stand as a finishing touch. via handimania. This dark, wooden table has a very unique look, but it’s hard to find a real purpose for such unique furniture. The makeover into a Lego construction station included a good polishing, as well as the installation of a wicker basket for pieces in the top space and a fixed playing top in the bottom area. via fussymonkeybiz. It is quite simple to make a cute, space-saving dresser with bookshelves from an old chest of drawers and some racks. All you need to do is polish and paint your drawers and racks to match and then trim the racks to size before installing them on the sides of your drawers as a small, combined bookshelf. via onthebanksofsquawcreek. Dressers naturally lend themselves to become vanities, and this one is a good example of that. The main change is the installation of a sink in the counter and top drawer space. An actual counter was added and the whole piece repainted before it was installed in the bathroom along with a large mirror. via anoregoncottage. This black and white flower print storage dresser may have been beautiful once, but certainly needed an update to become current. A good polishing, wood-carving and a coating of solid color converted it into a charming, vintage-style French bookshelf. via 4theloveofwood. There are several ways to repurpose old dressers, but only a creative mind would think of creating a crafts station with it. The dresser itself was mostly kept intact aside from being painted, but a long matching counter, as well wall storage, a bench and smaller table top units were added to create a perfect workspace. No one would have guessed what this beautiful, cream, vintage-style bookshelf looked like as a traditional dresser hatch. A change of position, color and texture gave it a new life as a stunningly elegant open shelf. via hannahbunker. Great things can be found at thrift stores, and this door-turned-beverage stand is a great example of that. Other pieces, such as the beverage table and sign had to be built from scratch, but once it was polished and painted, the door made for a great background and frame. via oursouthernhomesc. This little spool was altered and painted a distressed white so it became a really cool, small, carousel-like bookcase. via pinkxstitches. This little project is an undeniable stroke of genius. 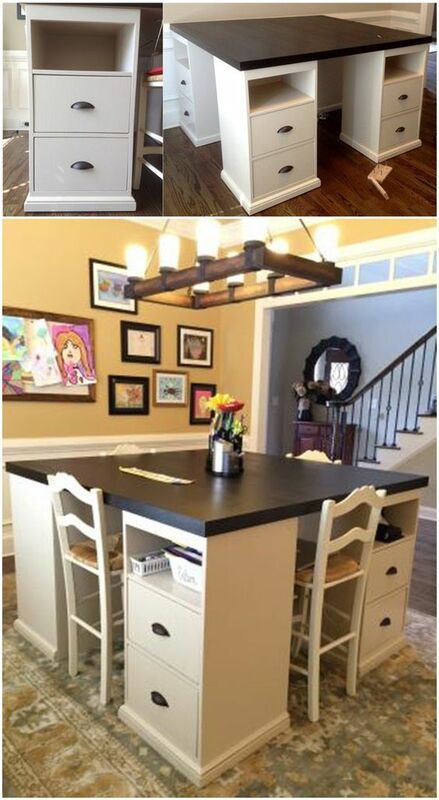 The main frame and door of an old kitchen cabinet were purposed into a child’s desk with small feet, a blackboard top and an opaque coat of white paint. via ehow. Have you ever noticed that a headboard can be quite similar to a bench? Whoever did this obviously had. Not a lot of changes were needed to achieve this shabby chic piece, except for painting it a soft mint and adding some throw pillows for comfort and decoration. via confessionsofaserialdiyer. Once again, this ladder already had all it needed to become a nice towel rack, so all that was done was give it a new color, install it against the wall by the sink and drape the towels over the rungs for a laid back look. via funkyjunkinteriors. 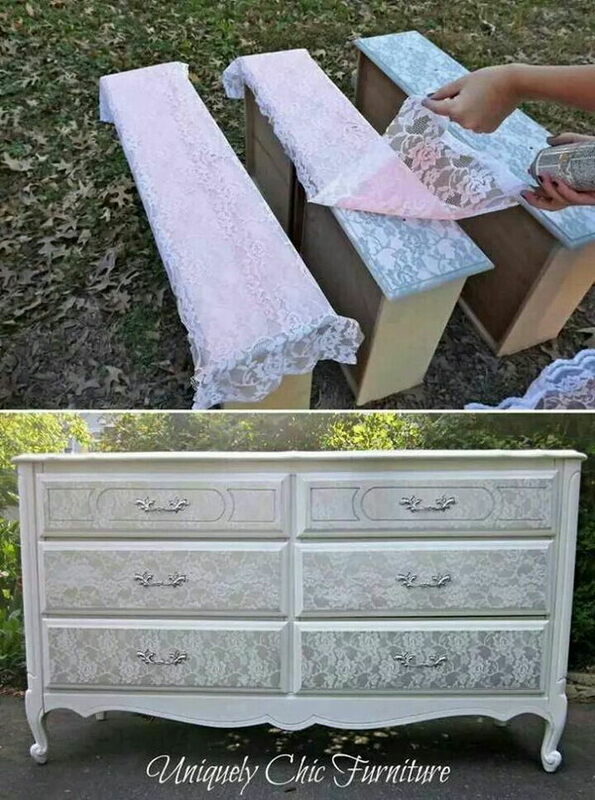 This dresser looks much different as a shabby chic bench with storage underneath, but the transformation is actually pretty simple. The three upper layers of drawers were replaced by a floral cushion and pillows, and the whole structure was painted in smooth light blue to complete the makeover. via createinspireme. Using an old shutter as a rustic porch bench was a great idea in this case, as all that was done was install some feet to support the bench, add some pillows and drape a light, neutral throw blanket over the top to finish the makeover. via lizmarieblog. Headboards can be quite versatile, but so can repurposed doors. This one made for a perfect and original headboard once it was polished and repainted. via infarrantlycreative. 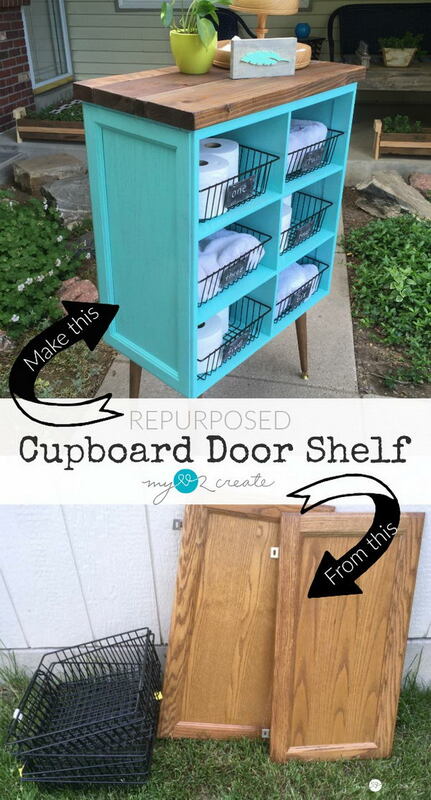 Making an open shelf like this blue one is a great way to repurpose parts from old furniture, get some extra storage room and add a new, lively touch to a room. via myrepurposedlife. This is a great way to update your cabinets to the shabby chic style – by using lace to create a patterned paint job. Spray paint is really affordable and easy to use, and you can do this with any pastel or metallic color you like to achieve a similar effect. via uniquelychicmosaics. The wooden table with drawers was in beautiful condition, but the traditional wood grain look was outdated. A solid pink color and smaller drawer knobs give it an instantly updated feel. via theshabbycreekcottage. This set of table and chairs was gorgeous and in great condition, but its polished dark surface didn’t match the room so it was painted a lighter wood color and distressed planks were used to cover the top for a rustic look and feel. via flutterflutter. This old, simple wooden bench got a full shabby chic makeover, complete with distressed pink paint and a lacy, drop cloth rosette over the seat. via confessionsofaserialdiyer. This dresser was a great starting piece for building a gorgeous periwinkle shabby chic mudroom bench, complete with a coat rack and overhead storage. via theweekendcountrygirl. 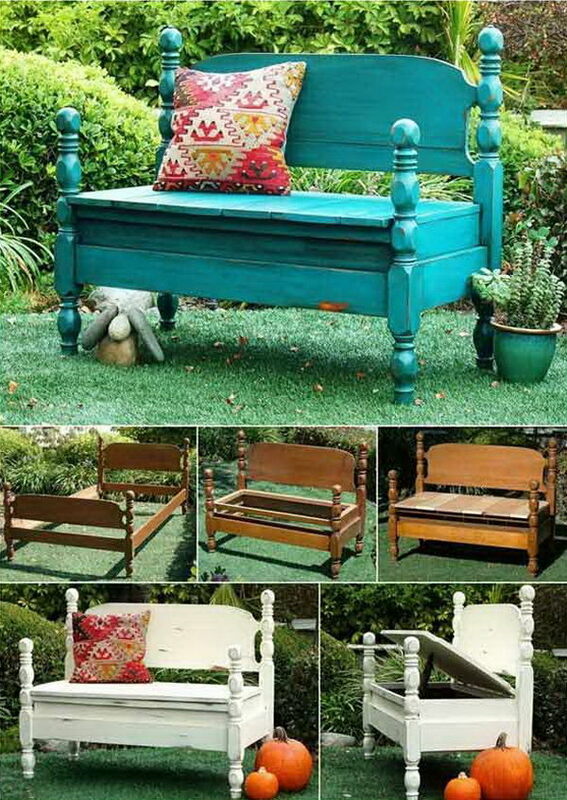 Turning beds into garden benches is quite an ingenious and unexpected idea, but it is also undeniable that it works, as the headboards make for a beautiful and highly functional backing. via jillsabode. 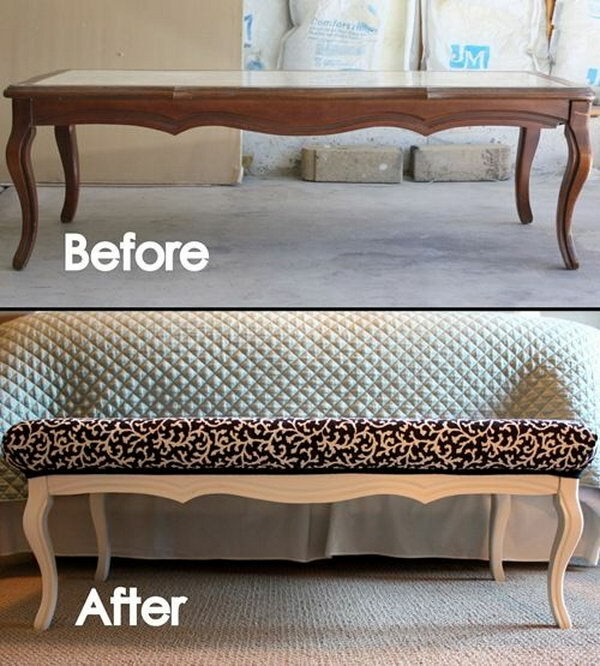 This is another “divide and conquer” style coffee table makeover. By diving the table in half and painting both halves a rich pink, the owner got two gorgeous and functional wall-supported bedside tables while saving good money. via hgtv. 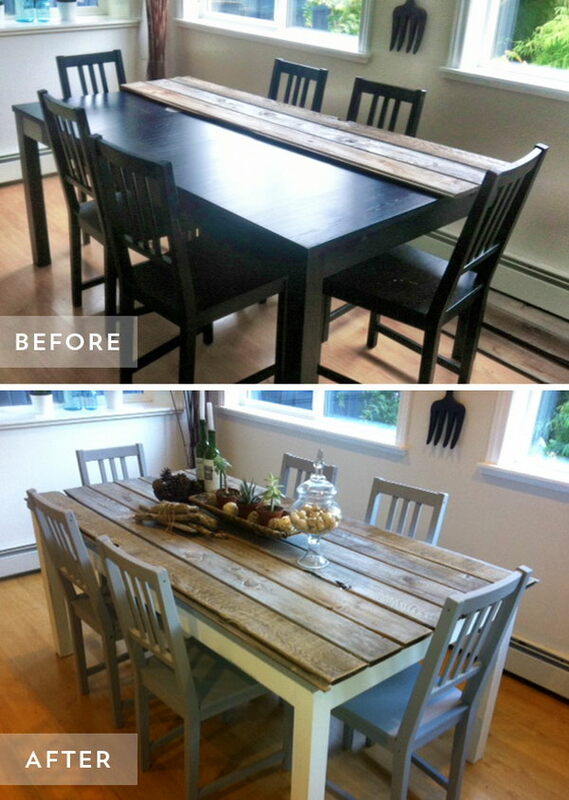 This is a great example of how to make something quite impressive from a very inexpensive piece. 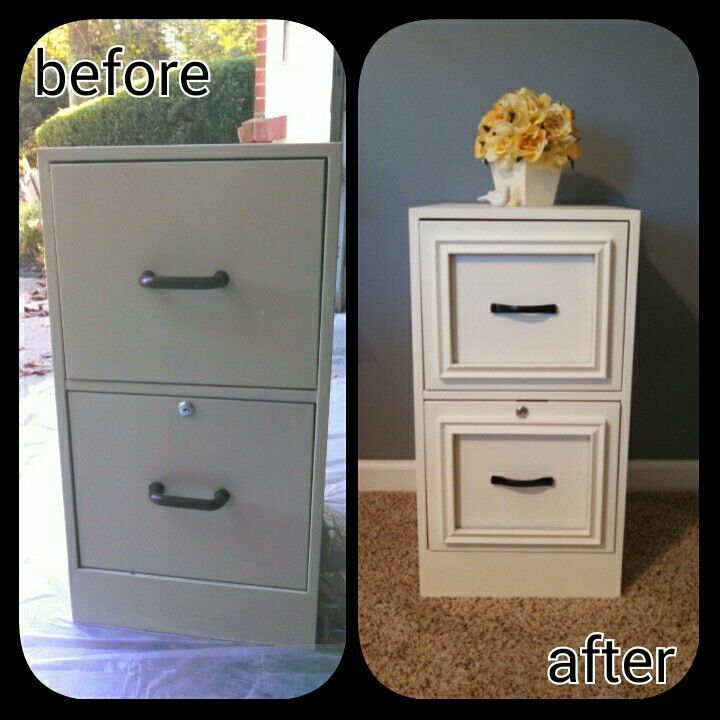 Cheap frames and cream colored paint turned this filling cabinet into a unique, intricate looking nightstand that could fool even trained eyes. This is a very impressive project, as the cabinet was transformed into a unique kitchen island with open shelves and pull-out doors, which can be used as trash containers, for instance. via sawdust2stitches. This console table is really cool-looking and not hard or expensive to make – at all. Gather some nice beams as well as wood planks, assemble and paint them – that’s all there is to it. via shanty-2-chic. This is as much of a hack on how to make your kitchen look finished and expensive as it is a makeover project. Paint your faucets and pulls in a metallic color to make them look more luxurious and add sticker tiles to fake a backdrop – no one will be the wiser. via jennycollier. This old oak China buffet is a great piece, but it lacked function and a modern twist. 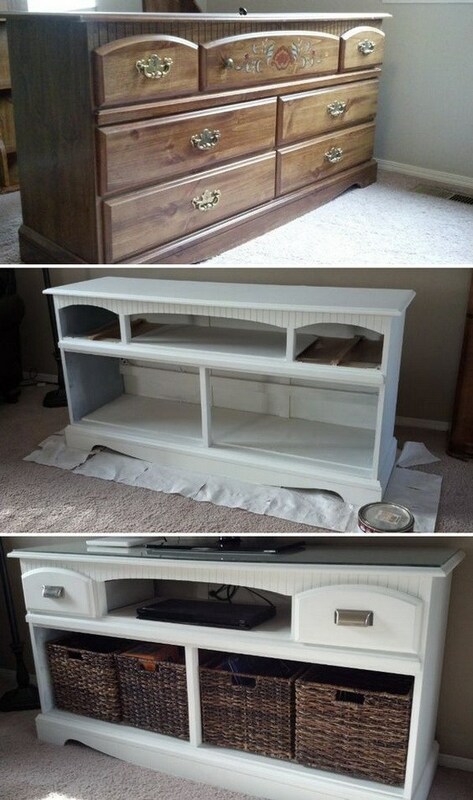 Taking the drawers out and painting it white updated the look of the piece and allowed it to become an extraordinary and functional TV stand. via thehomesihavemade. This worn out desk was definitely shabby, not at all chic. The polished two-tone color makeover and the addition of a reverse, also color-blocking chair added the chic element that it was desperately in need of. via prodigalpieces. This really neat clock table is actually really easy to make with a small bench or table, a round top and a good template. Transferring the template to the piece is easy enough and can be done with a number of images, but it looks very impressive overall. via scavengerchic. 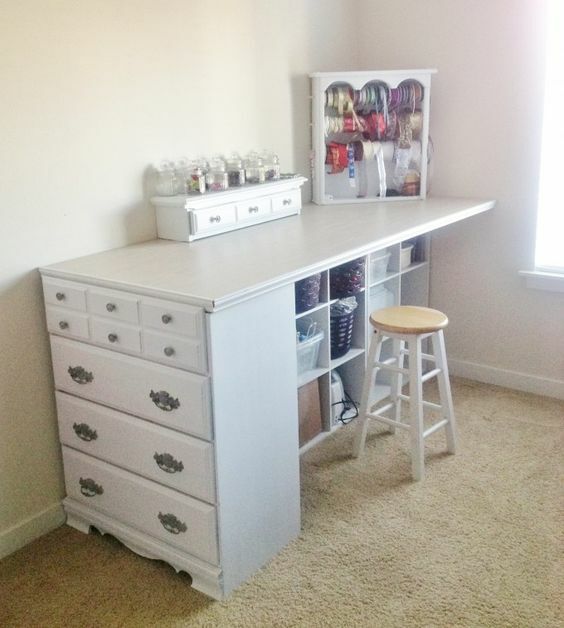 This four station desk is much easier to make than it looks, if you use four identical and inexpensive storage towers and install them under each corner of a large board to serve as a counter top. Add matching chairs to each station and you’re done. via ana-white. This organizer is really easy to make using existing cube storage and different plank dividers. The result is an awesome open organizer with shelves of different shapes and sizes, perfect for storing different craft materials. via thecountrychiccottage. This tree bench is a really great project to attempt if you’d like to fully repurpose a set of old kitchen chairs, as it makes use of the backs – in the middle – as well as the seats and legs, which serve as the supporting base. via hometalk. Making this peninsula is one of the easiest projects here. 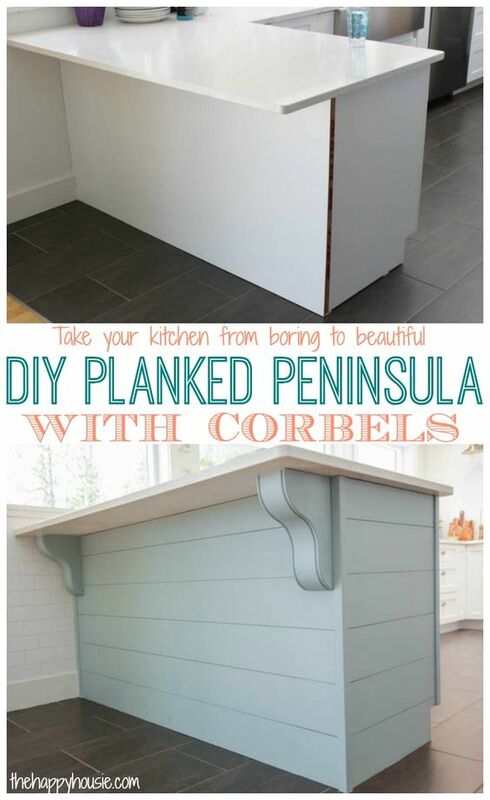 All that was done was add the planks along the previously boring smooth sides and then install the corbels on the counter’s underside. It makes all the difference though. via thehappyhousie. The kitchen island makeover is really clever, as all it took was a new, longer counter, a couple ofbeams and a new color. via ishouldbemoppingthefloor. 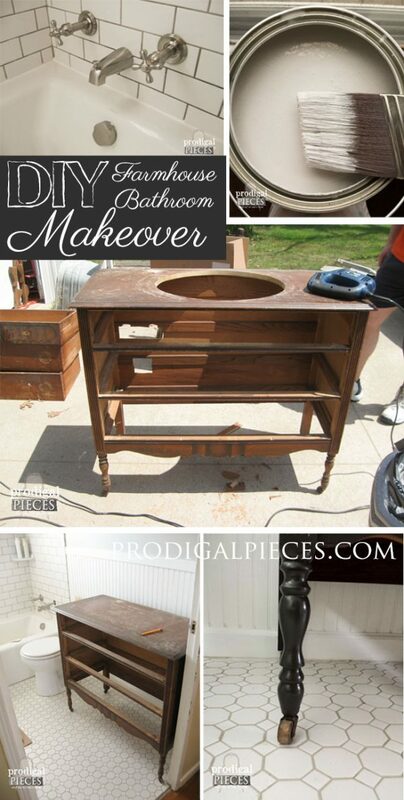 This repurposed wooden hobby dresser fits right in as a vanity in this farmhouse bathroom makeover. via prodigalpieces.